So I was leafing through my prized copy of "He-She Jewelry", which I purchased a while back with actual money1 that could hypothetically have been used to pay off credit-card debt. I decided it was time to blog about this 16-page, full-color jewelry catalog, which was published by Craft Course Publishers in 1976, was written by Keith Fellows and contains the following fantastic disclaimer: "Due to variations in materials and differing climatic conditions, Craft Course Publishers cannot be responsible for untoward results." 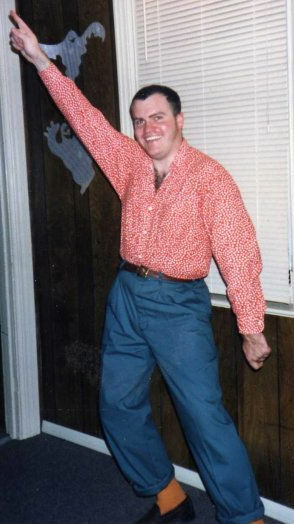 From the catalog, I chose and scanned the two grooviest photos of male models. 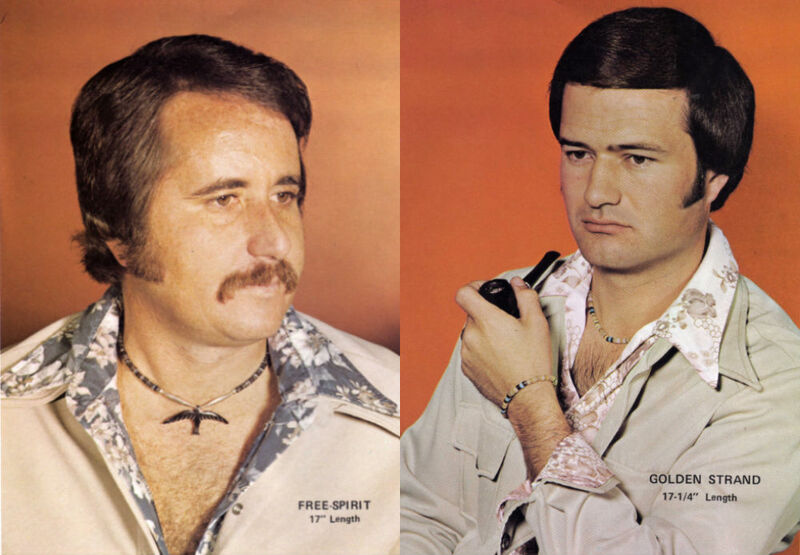 They are pictured above in all of their 1970s glory, with sideburns, jewelry, wide lapels and chest hair. Then, performing my due diligence, I researched the "He-She Jewelry" catalog online. I found a January 2009 blog entry on Chris And Shana's Online Dairy Diary. And, lo and behold, not only did Chris and Shana write a snarky piece about bad hair and posing and with pipes, but they used THE SAME TWO PHOTOS THAT I CHOSE. A bigger issue I want to touch on here is that these two models from "He-She Jewelry" are never going to have any peace, thanks to the Internet. Those catalogs should all have been trashed or forgotten by now. But thanks to certain bloggers who scan forgotten ephemera and send it out to the worldwide masses surfing the web, those guys are going to be around forever. Maybe they'll even become a meme someday, like Leeroy Jenkins. The good news is that most people in my generation understand the devastating speed with which the spread of news or photos on the Internet can affect one's life and social standing. And so we are able to take careful steps to avoid any potentially embarrassing material ever finding its way online. And that's great peace of mind. 1. I paid 25 cents. 2. Chris and Shana are from Lincolnshire, England. 3. Yes, that was a shameless plug for a person I've never met or spoken to about a book I've never read. It could be terrible. But wouldn't you want to purchase a book written by a guy who blogs about 1970s jewelry catalogs? I need your answer on this to be yes. The Modicum of Daftitude book (now available at half price) is an amusing read, even if I do say so myself. And Chris, if you come over to England and bring a copy, I promise I'll autograph it for you. I feel that our two couples, both anchored by a man named Chris and both with two clearly patient wives, could make for good friends. If we could get over that whole ocean in the middle.